Disney's Frozen Ever After ride, which opened in 2016, is one of Epcot's most popular attractions. Based on the hit animated film Frozen, the ride features scenes from the movie and from the 2015 animated short feature, Frozen Fever. There are no height restrictions, and the ride is unimposing enough that virtually anybody should enjoy it. Frozen Ever After replaced the Maelstrom attraction at the Norway pavilion in Epcot, using the same tracks and vehicles. The revamped ride takes passengers on a journey to Arendelle for the Winter in Summer Celebration. Stops along the route include Queen Elsa's Ice Palace and the North Mountain. Royal sibling Queen Anna is along for the ride too, and so is everyone's favorite comic snowman, Olaf. The animatronic characters are quite well done. An ice skating Olaf is especially agile. Anna and Elsa are animated using imagery that is projected onto their dimensional faces. Imagineering uses the same concept in other attractions such as The Little Mermaid and Seven Dwarfs rides at the Magic Kingdom. Frozen Ever After includes a rousing rendition of “Let it Go,” the movie’s signature song. The ride, which ends with (a relatively gentle) backwards drop, is fairly short. 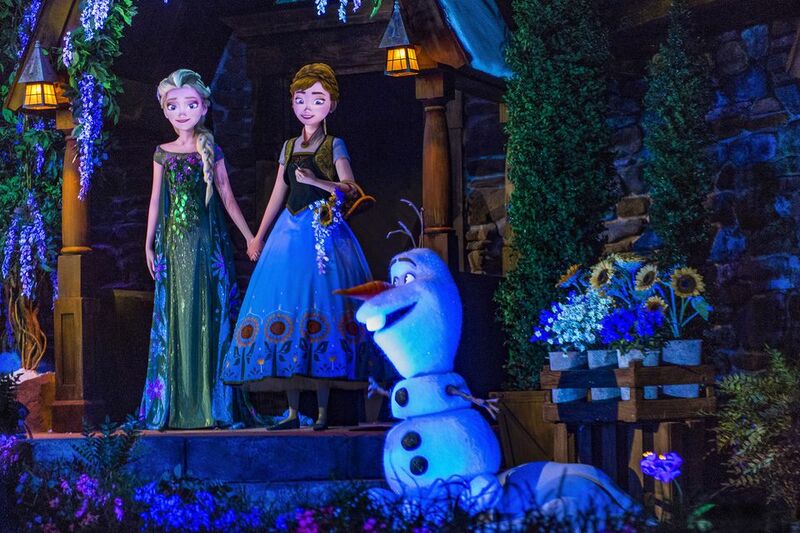 After the ride, guests can meet Anna and Elsa at their "Royal Sommerhaus." When Disney World began offering meet and greets with the Frozen gang, wait times quickly swelled up to five hours. Since then, the parks introduced My Disney Experience and allowed guests to reserve character greetings by reserving FastPass+ passes. There isn't as much demand to meet the characters now that the film has been out for a few years, but they are still popular. If your kids (or you) absolutely have to meet the royal sisters, take advantage of the advance planning program. The Frozen ride is based in the Norway pavilion of Epcot. Typically, the pavilions at the park have represented their countries' histories, architecture, landscaping, and cuisine. Young people from each of the countries staff the pavilions, and live entertainers representing each country's culture perform. Norway was not one of the original pavilions at Epcot, but was added in 1988. To date, it's the only pavilion at the theme park with fictional characters representing part of its cultural entertainment. It's interesting to note that when Epcot first opened, Mickey and his cartoon pals were banished from the park. Disney wanted the world's fair/edutainment park—its first to deviate from the Disneyland model—to have a unique identity. Epcot-only characters Figment and Dreamfinder added some levity at the Imagination pavilion, but the rest of the park adopted a more serious tone. With Disney incorporating Frozen characters into the mix, it's clear how far Epcot has evolved from its original vision. A Guardians of the Galaxy ride is scheduled for the park’s Future World. At Disney's Hollywood Studios, guests can bop along with the characters at For the First Time in Forever: A Frozen Sing-Along Celebration. Olaf is also available for photos and greetings at the movie-themed park. The princesses also appear in the daily Festival of Fantasy Parade at the Magic Kingdom. Clearly, the movie is a gift that keeps on giving at Disney World. Like the Wizarding World of Harry Potter at Universal Orlando, fans are crazy about "Frozen."